There was snow everywhere, on my jacket, inside my beanie and even my mouth and nose. For a split second, I thought, "What am I doing here?" Though I had worn at least four layers of clothes, I could still feel the bruises on my legs and arms, and a slight pain, which only intensified over the next 20 minutes, in my ribs. "Get up," I told myself, ready for another try on my snowboard as there was nothing else to do. I remember watching people snowboarding on TV when I was younger. At that moment, I was sure I could be good at snowboarding, too. I have never been someone who loves extreme sports, let alone adrenalin, but for some reason, it felt like I could do it, and do it pretty good. For years, I begged my mother to take me to the mountains. As she is from Bursa, home to Mt. Uludağ, one of the most popular ski resorts in Turkey, I thought she would take me at least once. Being an overprotective mom, she never did it, and justified herself by saying I would definitely break my arm or worse. Apart from its dangers, skiing is an expensive sport. If you do not already have the gear, you have to buy the whole lot, meaning a hole in your wallet. You could rent everything, but I hate wearing clothes that others have worn who knows how many times. So, I never had a chance to go to the mountains when I was a student or after I got my first job. I never gave up though. I always checked the fees, scrolled down the webpages of travel agencies to find somewhere cheap and fun. Finally, I found what I was looking for: An ad promoting Bansko as cheap and its ski tracks as amazing sold me right away. I was going to ski in Europe. For many, skiing in Europe means the Alps. For me it was Bulgaria. Located in southwestern Bulgaria, Bansko is at the foot of the Pirin Mountains. What makes Bansko an attraction for people in Europe and even in the Americas is its world-class runs that have hosted many international championships, including the FIS World Cup alpine ski races where women raced in 2009 in two downhills and a super G. The men's circuit made its first stop in Bansko in 2011 with a super combined and the slalom. It hosted the men's giant slalom in February 2012 and the FIS World Cup women's downhill and super G, and men's giant slalom and slalom. This small Bulgarian town also hosted this year's FIS Snowboard World Cup. Alpine and biathlon competitions take place there regularly. The perk of Bansko for me was also its closeness to where I live in Istanbul. That meant I did not have to go by plane and could just hop on a bus heading to the other side of the border. The first thing to do was arrange a trip with my all-time favorite travel companion, my husband. Since I had no idea about ski travel, I decided to not take chances and plan through a travel agency in Istanbul. They charged us 200 euros each, including accommodation and logistic fees. After setting the date and choosing the hotel, I went shopping for some skiing clothes that would keep me warm on the mountain. While shopping, the first thing to keep in mind is comfort. Instead of tight clothes that fit me, I chose to buy loose clothes that would not hinder me from doing the moves that I am supposed to do since I still had the feeling that I was a natural snowboarder. I skipped buying any snowboard equipment, as I was confident that there were places in Bansko where I could rent it. The one thing that you must splurge on is a pair of good ski goggles, as they protect half of your face from the snow and cold. If you do not have a large suitcase, you should definitely buy one. All of the ski clothes, thick sweaters and thermals leave little space for much else. From Istanbul to Bansko, Bulgaria, is only 565 kilometers, but if you are traveling by bus or car, you have to wait at least one-and-a-half hours just to cross the border. For a quicker trip, you could take a plane to the capital Sofia – a one hour and 15 minute flight from Istanbul – and take a bus from there to Bansko, which also takes two hours. However, if you go by plane and have to check your own ski equipment, it can cost you a lot of money. We left Istanbul around midnight, and it took us nine hours to get to Bansko thanks to very slow border officers on the Bulgarian side. The road to Bansko is quite pleasant, especially once you get to the mountains. As the bus winds to the top, it is a joy to watch the trees covered with snow. I am from İzmir where it almost never snows, so snow still excites me. Once we reached Bansko, the first thing I noticed was how small the town really is. The outskirts of the ski resort are full of small houses where the locals live. Once you arrive at the touristy part of town, the view changes. This part of the town where the ski resorts are is livelier and definitely more crowded. The hotels are usually located close to the slopes. In the center, there are many places where you can rent ski equipment. After arriving at our hotel, I decided to go snowboarding as soon as possible. I went to rent a snowboard and a helmet – it does not hurt to be extra careful – and I met a Turkish national snowboarder there who happened to be giving two-hour lessons. The rental fee for a snowboard, boots and a helmet cost me 145 lev ($91) for four days, and the lesson was 80 euros. Now, all I had to do was to get to the top of the run. Unfortunately, I could not, and my disappointment grew. It turned out that I had to learn, not on the top, but at the very bottom. Then, my instructor told me to put the snowboard on my feet, and it was a lot harder than it looked. Trying to stand up with snowboard on your feet; I do not even want to get into it. In short, by the end of the two hours, I was bruised, both my body and soul. The next day, I decided to explore Bansko's slopes. Bansko boasts 75 kilometers of ski runs, the longest stretching 16 kilometers. About 90 percent of the runs are equipped with snow blowers for long-lasting, high-quality, artificial snow cover. The runs range in difficulty, the most challenging being Tomba, named after Italian skier Alberto Tomba. There are about 14 runs in Bansko. Shiligarnik and Bunderitsa are the busiest since they offer something for beginners, advanced skiers and snowboarders. A gondola in Bansko takes you to the starting point of the ski lift in Banderishka Polyana. However, as there was always a long line for the lift, I took a taxi. On my first day alone with my board, I decided to hit the easiest slope, which locals call the "baby slope." This is very short and designed for beginners. Here you come across all sorts of people ranging from 5 years old to 50. All day, from 10 a.m. to 5 p.m., I fell. I discovered that getting up with a snowboard was the easy part, and the hard part was actually snowboarding. At the end of my second day on the mountain, I was injured, cold and had no energy to even get up. But luckily, I learned the basic tricks of snowboarding by the end of the day. On my second day, I decided to go further up to a slope called Shiligarnik as it was impossible to use the "baby slope" due to the crowd. It is hard to learn when people fall right in front of you, and sometimes it is better to take the risk. The most annoying thing about Bansko is the lift ticket. At 58 lev a day, you have to buy it every day to access the different runs on the mountain. my feet. If I could have wrestled the board off, I would have definitely run away. Once I got the edge, I asked my husband for a little push as I was shaking with fear. Throughout the day, I fell, got up and fell again, but I snowboarded. It felt really good. Once you learn to balance, snowboarding is one of the most entertaining things you could ever do. You feel free and fly like a bird as the cold breeze hits your face. Between my falls and little time that I actually did snowboard, we took time outs in the cafes dotting the mountain. As Bansko's runs are very long, it is hard to finish them in one go, so there are cafes every 3 kilometers or so where you can catch your breath and warm up by a fireplace. Also, I really enjoyed watching other people fall. It really helped my self-esteem as I sipped my hot chocolate. As far as snowboarding is concerned, it is quite fun once you learned to stand up. During my four-day trip to Bansko, I was impressed by the things that this small Bulgarian town has to offer. If you are not that into skiing, you can always hike in the mountains and relax in the town's hot springs. Some hotels even have their own spas. The food was good and cheap. For instance, you can have a big breakfast for just 6 lev. If you want to ski abroad but Courchevel or St. Moritz are out of your league, Bansko is a good choice for sure. 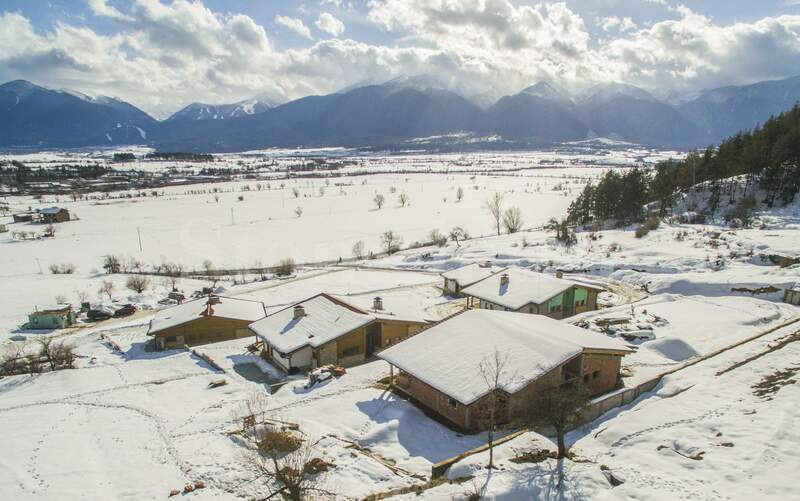 Check out our selection of properties in Bansko ski resort. This article is a derivative work that consists of adaptation or modification of the cited original article. If you have any questions, please contact STONEHARD Ltd.